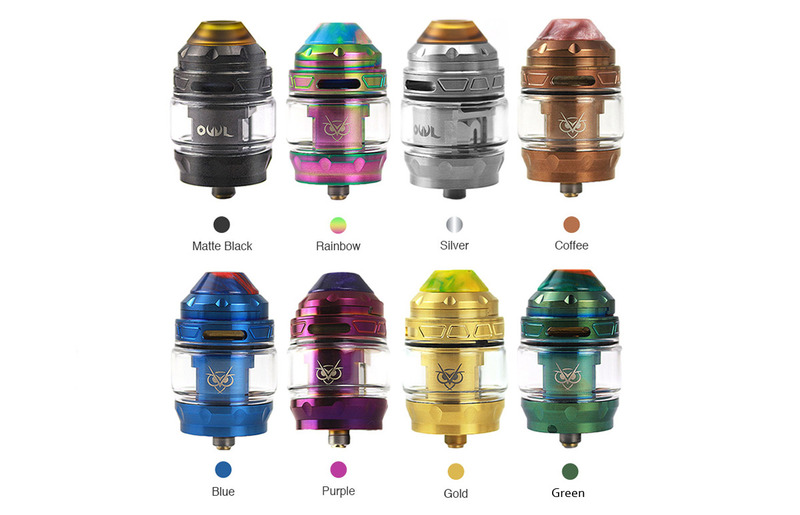 Discussion in 'Sub Ohm Tanks' started by Vapin4Joy, Mar 18, 2019. Hello folks I was sent a Owl for review from HealthCabin, this will not affect my personal opinion in any way, shape or form. I've had my Matte Black Owl for six weeks and have over 5000 hits on it, it arrived with a .2 Mesh coil installed, it also has a .16 Mesh coil in the kit along with extra o-rings and the usual paperwork and a nice polishing cloth. At first sight the tank is a looker, high quality finish and all of the threading is done very well/smooth. It's a top air flow, but it's not, it has two air channels that come from the top to directly below the coil in the base, different, but oh so good, has to be one of the smoothest tanks I've ever had and it does have plenty of air flow, the is a adjustable top ring with two cyclops ports. The entire tank can be disassembled, it has a sliding top fill, it does not lock but is quite firm when closed, I had no leaking at all. It has a 810 drip tip with a smaller bore, I do not like the tip, it's tapered and conical, I put on the extra tip from a Profile, much bigger bore and to me looks better. The .2 coil lasted 2 and a half weeks, the flavor was excellent and excellent clouds, a good coil! The .16 coil was a dud, just would not wick, the good news is that Baby Beast style coil will fit and work, I actually ended up using Vaperesso GT Mesh .18, the flavor is off the hook, not just good, really good. When I first got the Owl, I rushed to use it, so I prime and fill, screw it on the Rader Mage and juice everywhere. I clean up and take it apart and the o-ring on the base where the glass make contact is missing, luckily there was a extra included. Other than the missing o-ring and lousy drip tip, the tank in my opinion is a winner, excellent, excellent flavor and so smooth, it came with a 4ml bubble glass installed and there is a 3ml straight glass included. So do I recommend the Owl, yes I do, this one folks is a winner, I'm vaping on it now, writing this review, I have to say if I lost this one, I would purchase another one. A shout out to Cortana with HealthCabin for giving me this opportunity. The 810 drip tip would throw me off too, not sure I could get used to the style, Great review Vapin!!!! Nice write up. That DT is way more comfortable than it looks. It was just OK for me, too restricted, I put on the wide bore and the flavor really popped.